In Brighter Students... Brought to You By the Museum, Part I, we discuss the great need for teaching students critical thinking skills in Utah. We also describe how the Natural History Museum of Utah began a year of investigating virtual field trips in 6th grade classrooms in order to help teach critical thinking skills by using real-world problem solving from our paleontology department. Students said they loved collaborating with their classmates, they loved working on real problems, and they had lots of ideas for improving the experience. The Rosenblatt family was very supportive of our first year’s work and funded it for another year. They were joined by another funder passionate about education, the I.J. and Jeanné Wagner Foundation. In year two, we took the tested concept and created a series of investigations we called Research Quest. Then, over 250 sixth graders from Title I schools in rural and urban areas tested these prototypes. 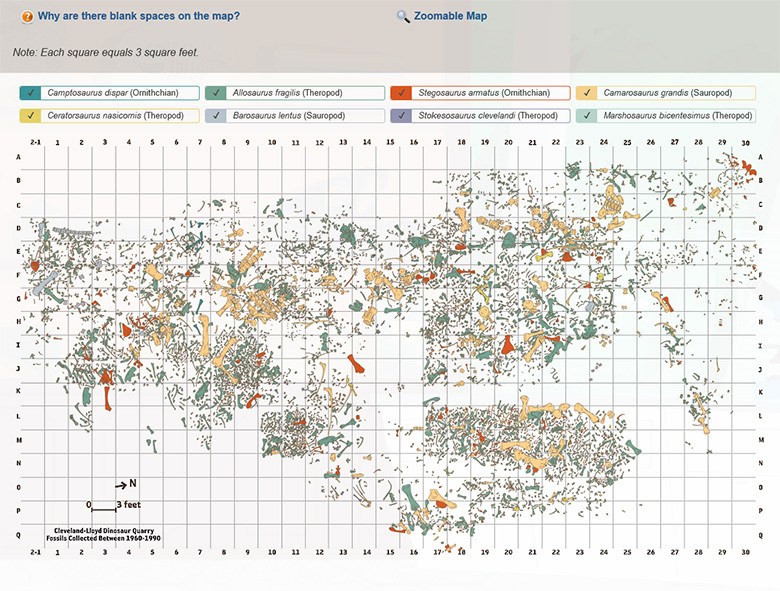 One of the interactive maps used in Research Quest: the placement of fossils found in Cleveland-Lloyd Quarry in central Utah. The program worked. Students had a measurable increase in critical thinking skills. With help from researchers from U of U's Instructional Design and Educational Technology Program, the team reviewed both qualitative and quantitative data from students. Statements like, "Usually, the first idea that I had was right during the quest" show a lack of critical thinking while statements like, "I changed my ideas after listening to evidence presented by others in my group" demonstrate the activation of critical thinking. Students wrote twice as many critical thinking statements than non-critical thinking statements in their surveys. The team also compared data from these students against data from control groups (similar grade level students who did not participate in Research Quest), and they found that they scored several points higher than control group students in critical thinking processes. Perhaps most impressively, when measuring both pre- and post-Research Quest, students improved significantly at evaluating conclusions (a significant part of critical thinking) while control groups did not. 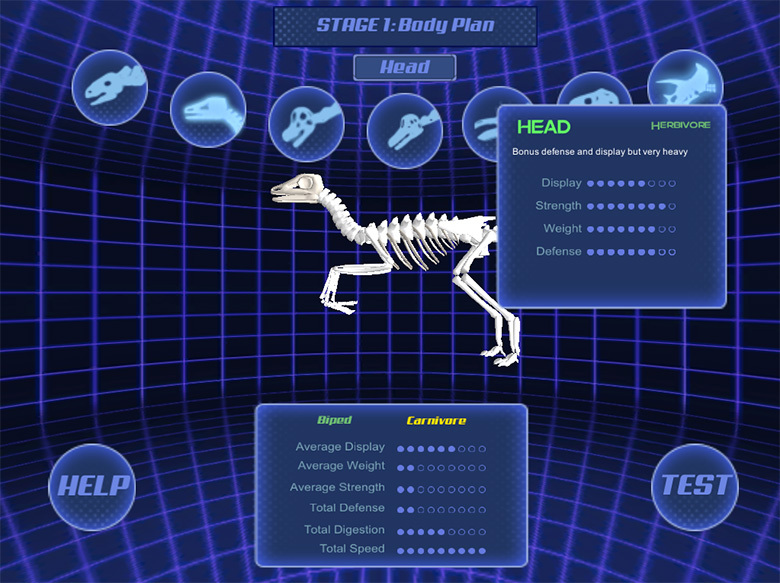 The Dino Lab interface in Research Quest, where students get a chance to build and test their own dinosaurs. Thanks to rigorous evaluations and observations of how students interacted with Research Quest, we’ve fine tuned and sharpened the investigations. The technology in the package is impressive: real museum objects, digitized for students to explore in three dimensions; a series of videos from our experts, guiding the students through the investigation; instructional guides for teachers; explanations of how the investigations map to state standards for science and English language arts; and much more. We plan to reach 500 Utah teachers and 15,000 Utah students in Year Three of the program, and we have our sights set on making the program available for national distribution online. The best part for Utah: everything is online and free to use by any school. The best part for us: the process was as important as the outcome. We were able to engage true investigation and problem solving in the way we developed Research Quest, effectively modeling this process for the community we serve. 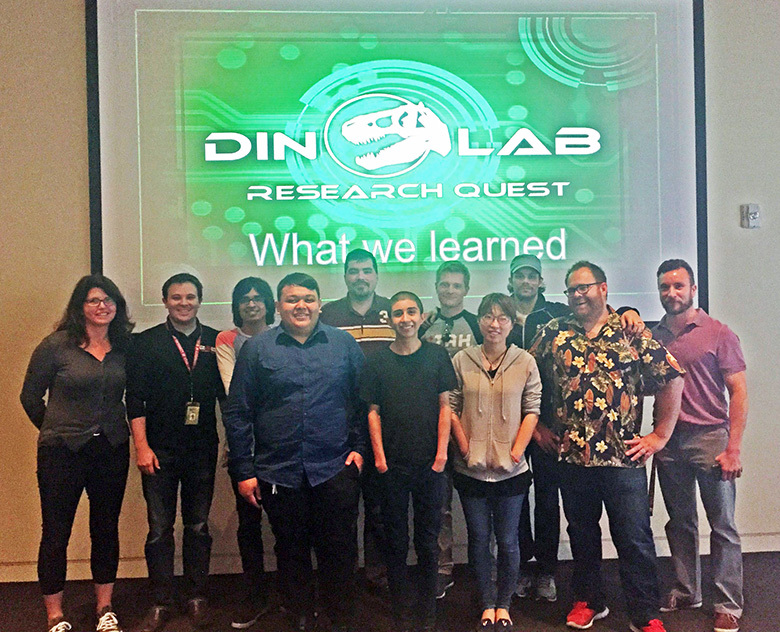 The team responsible for creating the Dino Lab portion of Research Quest.